Throughout the presentation, I will be using slides to include examples of the contract language that we’re discussing. As we look at the overall concept of design professional contracts or any kind of contract for that matter, there are basic elements of a contract that we’re going to look at. And these elements are going to include the scope of service, the performance schedule, the fee schedule, and the general terms and conditions. This course is going to focus largely on terms and conditions. And what we’re trying to strive for is to make the contract as clear and concise as we can and also to negotiate a what I call reasonable contract. Now I suppose you might say that reasonableness is in the eye of the beholder. However, I maintain that whether I’m speaking to an owner group, design group, or contractor group, my message is going to be fundamentally the same. So I’m not going to change my tune just to please the particular audience. I’m trying to strive for a contract that will be reasonable for all parties. Well, what is reasonable? And I would maintain that it is saying or allocating the risk and the responsibility to the parties that are most capable of managing those risks, in their offices, in the field, and by insurance. So in other words, who can insure the risk? And then we look to what is a fee in relation to the risk? What’s the history of the client? And is it a client that might be safe to work with, with a contract less than perfect, or is it a new client where you better really protect yourself with really rock solid contract terms and provisions? And the professor just looked at the student, and looked at all of us and he started to stammer and stutter. “Fair? This has nothing to do with fair. This is the law! It has nothing to do with fair!” And he slammed his book closed and he started marching out of the room. And as he got to the door, he turned back to us and he said, “You know, I submit to you, if you want fair, you don’t belong here. You belong across the street.” And he was gone, ten minutes into class, and it was the most profound class I ever had because as we sat there and we thought about “What in the world was that all about? And what is across the street?” Can you guess? It was a theological seminary at Villanova University. It was the Augustinian Theological Seminary. Well, we got the message that we don’t ask the court to act like a pastor, a priest or a rabbi. We ask the court to be a judge and only enforce what we agreed to and not try to make a contract more fair than what we negotiated. And so in this course today, we’re really going to emphasize trying to get contracts negotiated so that we can all live successfully under them for the good of the project. With that brief introduction, let’s get started turning now to the first of our clauses. 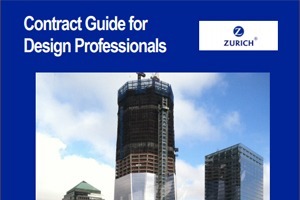 One of the benefits of that EJCDC clause, in particular, is that it explains that, look, there may be changes to the rules and requirements after the project gets started and it’s not reasonable to expect the design professional to make changes to its design with no compensation when it could not have anticipated these changes in the law coming along. So in this instance, the owner will be required to pay for those changes and those additional costs incurred by the design firm as an additional service. It seems reasonable because, again, it wasn’t something within the control of the design professional. The term “as-built drawings” might suggest that the design professional is assuring the owner that it reviewed drawings that were provided by the contractor and that it observed and measured the construction to determine that the drawings accurately reflect all the work performed by the contractor. Now that’s realistically not what happens in the field because normally a design professional has a limited role, possibly not having any construction administration function whatsoever and therefore only goes out on an occasional basis to see the project and observe what the contractor is doing. Even if it has a contract administration function, however, it’s still not literally inspecting the work but rather it’s observing, monitoring, reviewing the contractor on an occasional, periodic site visit basis and cannot possibly know every detail of what the contractor has done and whether it met every I&T of the contract plans and specifications. Certificates of payment gets to a similar issue and the AIA has developed good language for this at article 3.6.3.1 of the B101 and it reads as follows: “The architect’s certification for payment shall constitute a representation to the owner, based on the architect’s evaluation of the work as provided in Sections 3.6.2,” and then says “To the best of the architect’s knowledge, information and belief.” So again, with certificates of payment, the AIA language makes a certification based on best of knowledge, information, and belief, and what that does is it no longer constitutes an absolute certainty. It’s not a warranty. It’s not a guarantee. It is a way out. It’s a little bit of wiggle room. Changes to the design professional scope should be limited to those that are within the general scope of the original contract. There needs to be a limit on what the owner can unilaterally assign to the design firm. Here’s an example of a bad clause: “Owner may, at any time, by written notice, make changes in the services to be provided, including changes in the specifications and/or drawings, omit or add work, changes in the schedule, etc.” Change this by adding that the changes can only be made if they’re within the general scope. The AIA solution is found in section 4.3.1 of the B101 and it reads as follows: “Upon recognizing the need to perform the following additional services, the architect shall notify the owner with reasonable promptness and explain the facts and circumstances giving rise to the need. The architect shall not proceed to provide the following services until the architect receives the owner’s written authorization.” And then the provision goes on from there to list out a number of different additional services that the owner can assign to the design professional but only after the design professional architect goes to the owner and says, “This is what’s happening. We need to do this additional service based on what’s happening in the field.” So it puts a limitation upon what the owner can require and it provides for payment for the architect or the design professional for these additional services. We already talked about compliance with the Americans with Disabilities Act or the Fair Housing Act, and this is just sort of the bigger picture. This would be compliance with any and all laws. And my message is the same. Don’t create an absolute warranty and guarantee that the design professional services are going to comply with all laws and regulations and ordinances. An example of an owner-generated clause that is a problem is the following: “Regardless of where services are to be performed, the design professional warrants that it shall at all times comply with any and all applicable foreign, federal, state, and local government laws, ordinances, statutes, standards, rules, regulations, and guidance, including but not limited to those relating to working hours, working conditions, health and safety, and the environment.” That kind of language creates a warranty and is uninsurable because if you recall, insurance for design professionals covers negligent acts, errors and omissions, does not cover a warranty. And it certainly doesn’t cover a willful violation of law but that’s not what’s really going to happen. The design professional doesn’t go out and willfully, intentionally violate a law. More typically, it interprets a law that it believes is a reasonable interpretation but somebody else, maybe a governmental agency, says, “No, our interpretation is this way.” And unfortunately, they’re the government and they get to make that decision and the owner of the project often has to make changes because of those governmental decisions. And the question is does the design professional then have to redesign for free or even pay for the reconstruction, or rip out and tear out of equipment and materials and work because a governmental agency says, “This violated the building codes”? Well, if we put the standard of care into this so that we can have an expert testify that the contractor’s interpretation of the law or regulation was reasonable, then the answer is no, the owner doesn’t recover unless they prove lack of standard of care. So that becomes the key. So we want to put in that standard of care language and so the next clause I’m going to put up has that. Consider the following: “Design professional and owner will apply the reasonable standard of care to comply with applicable laws in effect at the time the services are performed hereunder, which to the best of their knowledge, information, and belief apply to their respective obligations under this agreement.” So notice the reasonable standard of care language, i.e. you’re not negligent. I like that clause because it really resolves the whole issue of whether when confronting a change in a law, is that going to be treated the same as a change in conditions or a differing site condition entitling the design professional to be paid? And yes, I think it is reasonable for that to occur. But, of course, you could negotiate this contract to go either with that. And so a lot of owner generated contracts, in fact, say that if any changes occur in the laws or regulations, the design professional simply has to make changes in its design to keep up with those changing laws but at no further cost to the owner. I would not agree to that clause. I recommend against it. I recommend a clause similar to what I’ve just put up here. That wraps up the program for today. Thanks for joining me. If you would like to contact me, please use the information provided on the slide that will be at the end of this video. I hope that you’ll tune in and join me again. Thank you. Goodbye.